SMIL 3.0 Server Playlist Profile is a new profile introduced in SMIL 3.0. It was not part of the SMIL 2.1. The SMIL 3.0 Server Playlist Profile is a collection of SMIL 3.0 modules that provide support for the SMIL 3.0 language within the context of the playlist used to manage radio/tv streams in the audio/video servers. 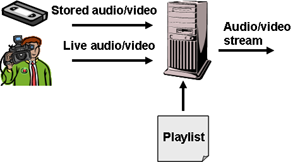 Using the playlist specified in SMIL, the server composes a set of audio/video files and/or online input streams to generate an output stream which is transmitted to the final user. Server playlists allow companies to generate a live stream from a set of contents. Figure shows the performance schema. Using stored audios and videos and live streams, a computing system can get and combine them in the way specified in a document named playlist. Have a set of pre-encoded files stored on the server and live streams. Build a document where the order of these files is stated (playlist). This document is then opened by the system to build a continuous stream of data by putting the files into sequence. Metadata may be added to the playlist and, depending on each of the available formats, basic timing functionality may be available (such as clipBegin or clipEnd). But, if we have SMIL, why do not we use it into these systems? We could have a standard format to define the playlist. Thus, we can use an editor from one company and a server from another one, the playlist can be reused for different services, even these tasks can be done by different companies (production studio/content provider, TV channel/service provider). In only one word, we could have "interoperability". Moreover, we can introduce new functionality and build more powerful systems. So the focus here is having a SERVER-ORIENTED SMIL format. In this section we will try to define how the server playlists can be used, and thus, to clarify what the main purpose of this profile is. The figure depicts how a live service works. Live audio/video services may use either stored or live contents. When live contents are used a tool called encoder or producer captures audio and video contents from an external source (e.g., a camera and a microphone), and then generates and sends a continuous stream of data packets to a streaming server. The server delivers then some of these data packets to the users who have requested the information, after applying the necessary changes (by changing sequence numbers, removing or adding specific fields in the header of the data packets, etc.). On the other hand, when stored contents are used, most software providers have different solutions to generate live streams using a set of previously-encoded files. We may call these solutions "oepostencoders" and the main providers have the solutions which follow. The live stream is after that, delivered to the final user through the Internet or broadcasted using common radio/TV channel. losberrones_10anos_ladelatele-a.rm?title="La de la tele"&author="Los Berrones"
In the example, the playlist uses 7 files in rm format and each of the files has two associated meta-data items: a title and the name of the author. The slta will open these files in a sequence or in random order depending on an available input parameter. Other developers are Microsoft (Windows Media Services) and Apple (Darwin/Quicktime Streaming Server). These companies provide what they call Server playlists. They have included a management tool to create and manage these lists of contents. A module in the server uses these playlists and performs actions similar to those exposed in the case of RealNetworks solutions. A reduced set of SMIL 2.0 is available in Microsoft solutions. As far as we know, it is impossible to play with layout (the elements available in Microsoft Server playlists are those in http://msdn.microsoft.com/library/default.asp?url=/library/en-us/wmsrvsdk/htm/playlistelements.asp). In the example, the playlist uses 4 files in wma format which will be opened sequentially with different starting points along their internal timeline. Standardize the playlists used by different providers. Depending on the format of the files to be used, different servers could share the same playlist. So if a change of technology is performed, the playlists can be easily installed in the new solution. Also, different authoring tools could be used to generate these playlists no matter the type of server we have. New functionality can be incorporated to these products. For instance, we can alternate between live and stored contents in the same playlist. We can play with the layout to have complex streams, similar to those available in a conventional TV channel, we can have complex timing features, etc. These examples are not available in some of the aforementioned solutions and more examples are provided in the following sections. All this functionality is currently supported by Microsoft, and RealNetworks only needs to update the parser of the slta. Supported by Microsoft, but RealNetworks requires considerable changes in the slta. Most server playlist technologies (at least RealNetworks) only allow the usage of stored contents. It could be possible to have more complex services where two types of companies are involved: Content providers and Broadcasters. For example, TVE, BBC and CNN (broadcasters) buy a football match to AudioVisual Sport (Sport Content Provider). This match is transmitted from the AudioVisual Sport server and each of the broadcasters would like to broadcast the match, combined with other contents depending on their scheduled program. One example is showed in the table. In it, the broadcaster combines the contents provided by different content providers with their own contents (either stored or live). Another example are broadcasters which have a common set of contents and then certain slots where specific contents are broadcasted depending on the region (in local languages, reporting about local news, etc.). Each local transmission may retrieve the general contents as stated on their playlists and combine them with other contents designed for that particular region. The SMIL 3.0 Server Playlist Profile is defined as a markup language. The syntax of this language is formally described with a document type definition (DTD) or an XML Schema which is based on the SMIL modules as defined in "The SMIL 3.0 Modules". In the text in this profile specification, the term Server Playlist Profile will be considered to refer exclusively to the SMIL 3.0 Server Playlist Profile as defined in this document. All elements introduced in extensions must have a skip-content attribute if it should be possible that their content is processed by Server Playlist Profile user agents. Conformant Server Playlist Profile user agents are expected to handle documents containing extensions that obey these two rules. The Server Playlist Profile is a conforming SMIL 3.0 specification. The rules for defining conformant documents are provided in the SMIL in the SMIL document. Note that while the section is written for the SMIL 3.0 Language profile, all of the rules apply to the Server Playlist Profile as well, with the exception that the Server Playlist Profile's namespace should be used instead of the SMIL 3.0 Language Profile's namespace and the Server Playlist Profile's DOCTYPE declaration should be used instead of the SMIL 3.0 Language Profile DOCTYPE declaration. Language designers and implementors wishing to extend the Server Playlist Profile must consider the implications of the use of namespace extension syntax. Please consult the section on Scalable Profiles for restrictions and recommendations for best practice when extending SMIL. <!DOCTYPE smil PUBLIC "-//W3C//DTD SMIL 3.0 Mobile//EN"
Since the Server Playlist Profile defines a conforming SMIL document, the rules for defining conformant user agents are the same as provided in the Conforming SMIL 3.0 Language User Agents in the SMIL 3.0 Language Profile document, with the exception that the conforming user agent must support the Server Playlist Profile's namespace instead of the SMIL Language Profile's namespace. The collection names contained in the following table define the Server Playlist Profile vocabulary. In the following sections, we define the set of elements and attributes used in each of the modules included in the Server Playlist Profile. The content model for each element is described. The content model of an element is a description of elements which can appear as its direct children. The special content model "EMPTY" means that a given element may not have children. The id, class and title attributes in the collection Core are defined for all the elements of the Server Playlist Profile. The id attribute is used in the Server Playlist Profile to assign a unique XML identifier to every element in a SMIL document. A conforming Server Playlist Profile document should not use the SMIL 1.0 attributes that have been depreciated in SMIL 2.0. Server Playlist Profile implementations are not required to support these attributes. This would be considered an unjustified burden for the targeted constraint devices. The unsupported depreciated SMIL 1.0 attributes are the following: anchor, background-color, clip-begin, clip-end, repeat; and the additional depreciated test attributes of Content Control: system-bitrate, system-captions, system-language, system-required, system-screen-size, and, system-screen-depth. The Layout Modules provide a framework for spatial layout of visual components. The Layout Modules define semantics for the region, root-layout, layout and the regPoint elements. The Server Playlist Profile includes the Layout functionality of the BasicLayout, AudioLayout, BackgroundTilingLayout, and AlignmentLayout modules. This profile adds the layout element to the content model of the head element of the Structure Module. The Media Object Modules provide a framework for declaring media. The Media Object Modules define semantics for the ref, audio, img, video, text, and textstream elements. The Server Playlist Profile includes the Media Object functionality of the BasicMedia and MediaClipping modules. This profile adds the ref, audio, img, video, text, and textstream elements to the content model of the par and seq elements of the Timing and Synchronization Modules and to the content model of the body element of the Structure Module. The Metainformation Module provides a framework for describing a document, either to inform the human user or to assist in automation. The Metainformation Module defines semantics for the meta and metadata elements. The Server Playlist Profile includes the Metainformation functionality of the Metainformation module. The content model of metadata is empty. Profiles that extend the Server Playlist Profile may define their own content model of the metadata element. The Structure Module provides a framework for structuring a SMIL document. The Structure Module defines semantics for the smil, head, and body elements. The Server Playlist Profile includes the Structure functionality of the Structure module. The Timing and Synchronization Modules provide a framework for describing timing structure, timing control properties and temporal relationships between elements. The Timing and Synchronization Modules define semantics for par and seq elements. In addition, these modules define semantics for attributes including begin, dur, end, repeatCount, repeatDur, min, max. The Server Playlist Profile includes the Timing and Synchronization functionality of the BasicInlineTiming, EventTiming, MinMaxTiming, RepeatTiming, BasicTimeContainers modules. This profile adds the par and seq elements to the content model of the body element of the Structure Module. The Mobile Profile specifies which types of events can be used as part of the begin and end attribute values. The supported events are described as Event-symbols according to the syntax introduced in the SMIL Timing and Synchronization module. focusInEvent (In DOM Level 2: "DOMFocusIn") end="foo.focusInEvent"
The Mobile Profile supports an extensible set of events. In order to resolve possible name conflicts with the events that are supported in this profile qualified event names are supported. Namespace prefixes are used to qualify the event names. As a result, the colon is reserved in begin and end attributes for qualifying event names. The Transition Effects Modules provide a framework for describing transitions such as fades and wipes. The Transition Modules define semantics for the transition element. The Server Playlist Profile includes the functionality of the BasicTransitions and FullScreenTransitions modules. The Transition Effects Modules add transIn and transOut attributes to ref, audio, img, video, text and textstream elements of the Media Object Modules.